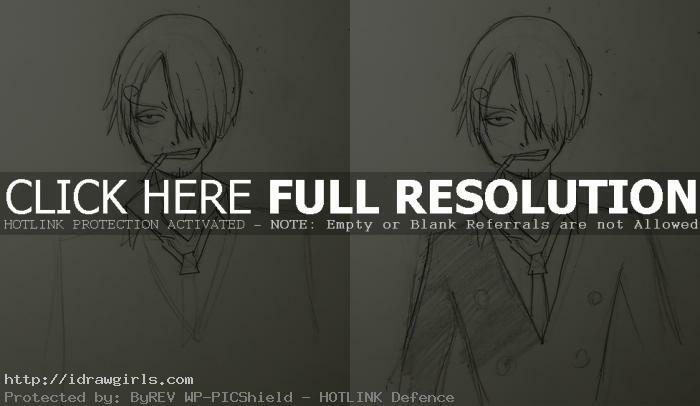 How to draw Sanji from One Piece. 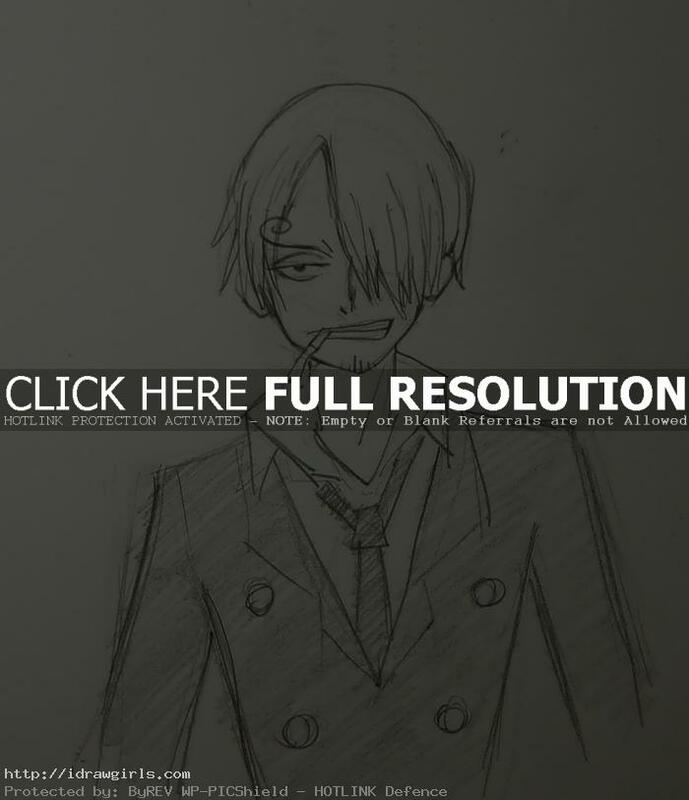 Learn to draw Anime Manga character Sanji step by step with easy to follow instruction. In this tutorial, you will learn to draw an Anime character’s face, body and hair. This tutorial is for beginners who want to learn to draw Anime character from One Piece. If you already know how to draw well, you might want to skip this. If you are really new, you might also want to go watch an Anime drawing video How to draw Ichigo Bleach along with or after you try out this tutorial. The video tutorial I mentioned, will help you understand my basic process and easy to follow Anime drawing instruction. Both are not quite the same, but it will help you with this tutorial. Since this is intend to be a basic tutorial, I only spend about twenty minutes for the drawing. Apologize for roughness. Sanji (サンジ), nicknamed “Black Leg” Sanji, is the Straw Hat Pirates’ cook. He knows how it feels to starve from first hand experience so he will never refuse someone a meal. He has a strong sense of gentleman and he will never harm a woman, even if he dies. Sanji also seems to keep this code regardless of a woman’s appearance. His dream is to find the “All Blue”, a legendary sea, containing every kind of fish in the world. Sanji only uses kicks while fighting. His fighting style resembles the capoeira. Here is a quick drawing of Sanji from One Piece. 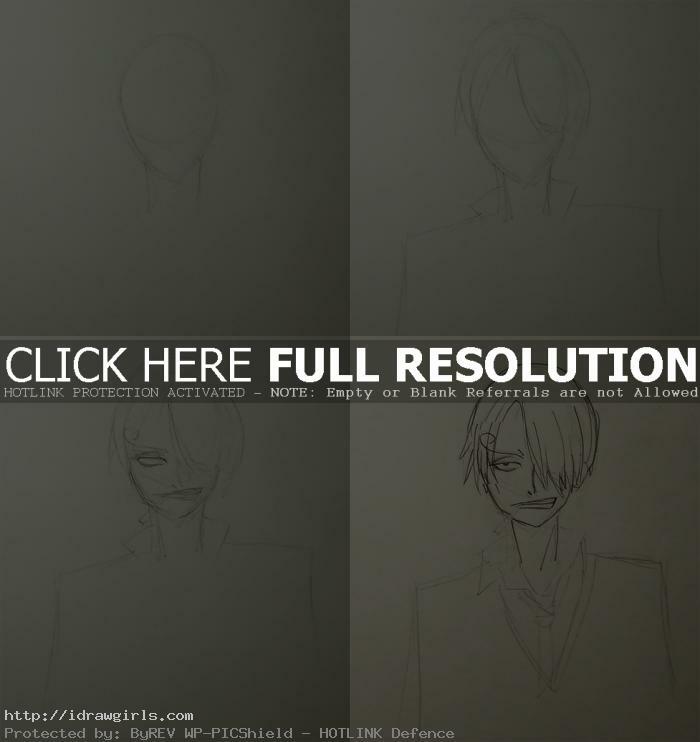 Below are step by step how to draw Sanji. Step one, I started with drawing egg shape for Sanji’s head. Step two, I roughly sketch out his hair style with big shape. At this stage, I will only draw very light, just in case I want to make some change in the future. Step three, now I sketch out her facial feature and make sure that they arrange correctly. Look at the reference if you need. One piece style is different than most Anime proportion and facial structure. Step four, at this stage I draw over with darker line on his face and hair. Step five, then I continued to draw all the way to his collars and tie. Step six, I drew his jacket with darker line and shade it dark . Then we are finished!